Lisa Guerin, Deborah C. England "The Essential Guide to Family & Medical Leave"
An indispensable guide to respecting employees' rights and protecting your business interests. The Family Medical Leave Act (FMLA) is a law with a noble purpose: To help employees balance the demands of work and family. But the FMLA can be difficult to apply in the real world, especially when other laws – such as workers' comp statutes or state leave laws – also come into play. Any misstep can create needless frustration for both managers and employees. How much leave can employees take? What are the employee's –and the company' s –notice obligations? What are a companys 'obligations to an employee on leave? How can a company minimize disruptions? 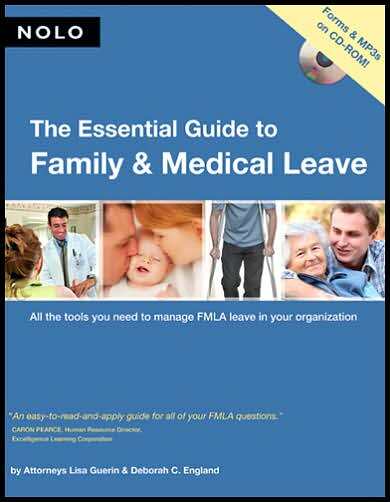 The Essential Guide to Family & Medical Leave also includes a CD-ROM packed with checklists, forms and worksheets, as well as audio dialogues that show how to communicate effectively with employees who need to take leave. Let The Essential Guide to Family & Medical Leave help you meet your legal obligations to employees, while also meeting your company's needs.